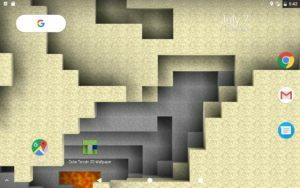 A Minecraft* inspired landscape that you can explore as you swipe through your home screens. See the depths of the caverns as you tilt. • Billions of landscape variations. • Selectable surface layer: Grass, Snow or Sand. • Selectable base layer: Lava or Water. • Selectable light level: Daylight, Sunset or Dusk. * NOT AN OFFICIAL MINECRAFT PRODUCT. NOT APPROVED BY OR ASSOCIATED WITH MOJANG.